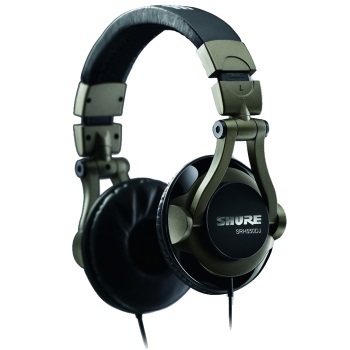 The SRH550DJ Headphones from Shure deliver full-range audio performance, comfort, and durability for DJ use and personal listening. 50 mm Dynamic drivers deliver enhanced bass, while padded ear cups with supra-aural design swivel 90 degrees for flexible wearing positions and full isolation. Includes a carrying bag and a threaded 1/4" (6.3) mm gold-plated adapter. Full-range frequency response with enhanced bass optimized for both DJ mixing and personal listening. Closed-back, supra-aural design rests comfortably and securely on the ears with full isolation. Adjustable, collapsible headband with 90-degree swivel ear cups for comfort and flexible wearing positions. Ultra-lightweight design folds to very small size for maximum portability. Legendary Shure quality to withstand the rigors of everyday use. Replaceable ear pads ensure long product life. Carrying bag protects headphones when on the go or not in use.